Hello Lovelies! I cannot believe it's Wednesday already! This week is flying by! Maxi dresses and skirts are some of my favorite things. They can be dressed up or down. What I really love about maxi dresses is that you can wear them as a dress or as a skirt. So you have endless possibilities! A good maxi dress is a must in everyones closet! I love maxi dresses! They are so comfy! great outfit! Hi Giovanna!! Thanks a lot for visiting and commenting on my blog!! If you would like to follow ecaht other just let me know!! BTW I also love maxi dresses. Not only are they comfy but also very stylish an easy to wear with practically every style!! Loving the maxi and that necklace! I love this! i have been searching for a good maxi - i feel like I"m so short that i can't pull them off that great. I love the shirt and necklace with this. Love this! I'm also a big fan of maxi dresses. I love the maxi skirt with that denim jacket. Good choice. I really love the maxi dress to. cute outfit! 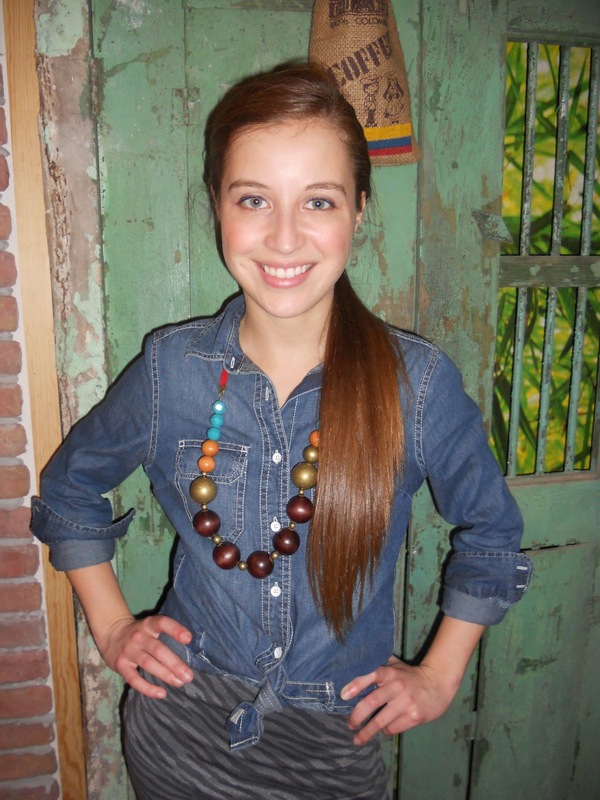 love your denim blouse! Very pretty. Love that skirt! I'm jealous, I'm so short I look like a hobbit when I wear such long skirts or dresses. Although, I think I could pull this off if I had those McQueem Armadillo heels, what do you think? Ahah You look really pretty here, it's a great Spring/Summer outfit! Great idea to use the denim shirt! I love your hair in a ponytail. SO cute! This dress as skirt looks really gorgous on you. I like how you combinated with denim shirt! You looks beautiful! awesome outfit...I'm looking for a denim shirt...totally obsessed with them. That maxi dress looks great with the blouse layered over top! Loving your outfit!! It fits you perfectly!! I really do love maxi dresses but haven't found one that I think is flattering on me. The hunt is still on though! Thanks for visiting our blog! We are following you via GFC! Love the maxi paired with the jean shirt. Such a great casual look! Hi girl. You looks great, love your denim shirt. I really like your blog, it’s so inspiring. 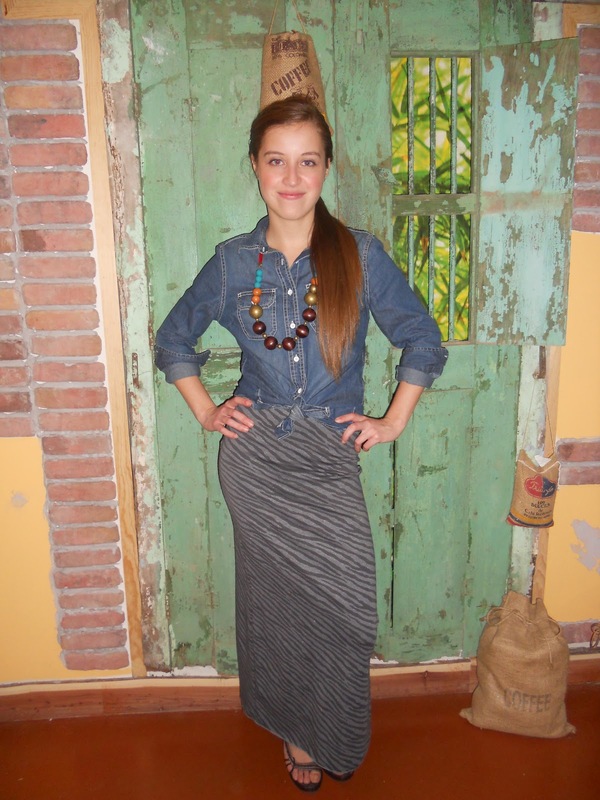 Love the denim shirt and the maxi jersey skirt!!! You loook awesome!! and of course the perfect necklace! I just scrolled through your blog and all your photos are so cute!!! where are you from, you have great weather!! lovey look dear! !love your skirt!! I don't actually own a maxi, though it's on my list for sure. You look adorable in this outfit! Hi dear, you look terrific, love how you styled the maxi with a denim shirt, gives it a great edge! love your outfit - cute necklace ;)!! I agree. I love maxi dresses and skirts as well. This one is super cute! that maxi looks amazing on you!!!! i love the combination of print and denim! I love this look! Maxi skirts + chambray?! Love it! love your outfit dear! that's effortlessly chic! Love the bohemian vibe of your outfit!! You look so beautiful! Hope you are having a wonderful day! Totally love this outfit, totally. the maxi is how i'm planning on surviving this spring. adore!! Agreed- everyone needs a good maxi dress (or two!). They're my favorite to wear and look surprisingly great on almost everyone. i love this maxi skirt! and the necklace is so beautiful! thanks for your comment yesterday, that made me find your wonderful blog! I followed you, and I'd be quite happy to have you perhaps as a follower too? Nice outfit!I love maxi dresses! I love that maxi!! You have a really nice blog, thank you for the comment you left on my blog, would you like to follow each other? Love this look! Chambray and maxis were clearly meant to be - must try this out in the summer :) Thanks for sharing! Beautiful. Necklace is my favorite item. lovely look! very cute skirt and the knot is charming! Wow, this outfit is amazing!! Love the skirt and the necklace! You look so pretty! So cute! I love your style girl! Hi Giovanna, your blog is really adorable, you're such a beauty and really don't look like 20+ haha and because I really fell in love with your blog I'm your new follower on bloglovin, keep up dear!